We often feature rare, collectible wines in our Cellar Favorites column. While it is undeniable thrilling to taste precious older wines, the reality is that few of us will have a chance to enjoy such vinous treasures. Perhaps even more importantly, the pure joy and pleasure transmitted by a gorgeous wine gently mellowed by the passage of time is not limited to bottles that cost a fortune and that only billionaires can afford. 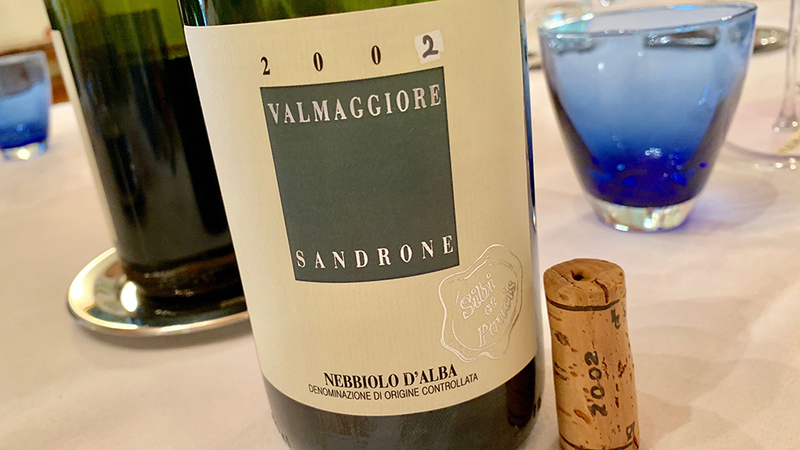 I was reminded of that recently when I tasted Luciano Sandrone’s 2002 Nebbiolo d’Alba Valmaggiore. As Piedmont fans know, 2002 was a brutal season. Severe hail in September decimated production after what had already been a cold, rainy year. I remember seeing entire hillsides basically wiped out and wineries with only a few of their tanks in use.